It’s one of the most epic car chases in movie history. Almost 10 minutes long, the iconic sequence in the Warner Bros. film “Bullitt” follows Steve McQueen at the wheel of a 1968 Mustang GT fastback as he chases two hitmen through the streets of San Francisco. In the film Robert Vaughn’s character Walter Chalmers says to Frank Bullitt (Steve McQueen): “Frank, we must all compromise”. The reply came back: ‘Bulls – – t’. Well there’s no compromise either with the new special edition Ford Mustang Bullitt. 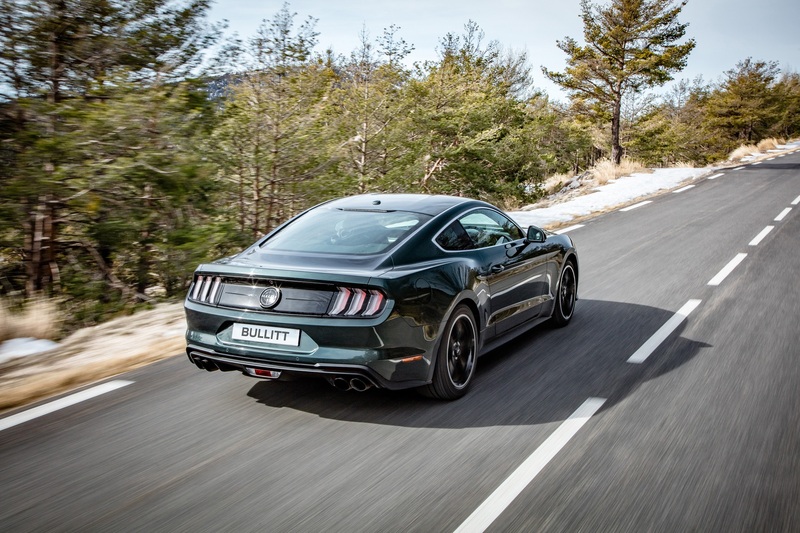 Celebrating the 50th anniversary of the legendary film, the new special edition Ford Mustang Bullitt is now available in Ireland and is powered by an enhanced version of Ford’s 5.0-litre V8 engine delivering 460 PS and 529 Nm of torque. It has a starting price of €73,092. And what a way to spend a Friday afternoon on the track at Mondello Park with the Mustang Bullitt and all the power that comes with it. Interesting rev-matching technology delivers smoother gear-changes and sporty V8 “blip” during Mustang Bullitt downshifts. There were no hitmen to chase at the Co Kildare venue, but I felt that the late great Steve McQueen would have appreciated the 20th. Century advancement in this modern day Mustang. Offered with a choice of classic Dark Highland Green or Shadow Black exterior colours, the Mustang Bullitt features 19-inch Torq Thrust-style wheels, red Brembo brake callipers and a faux Bullitt fuel-filler cap. 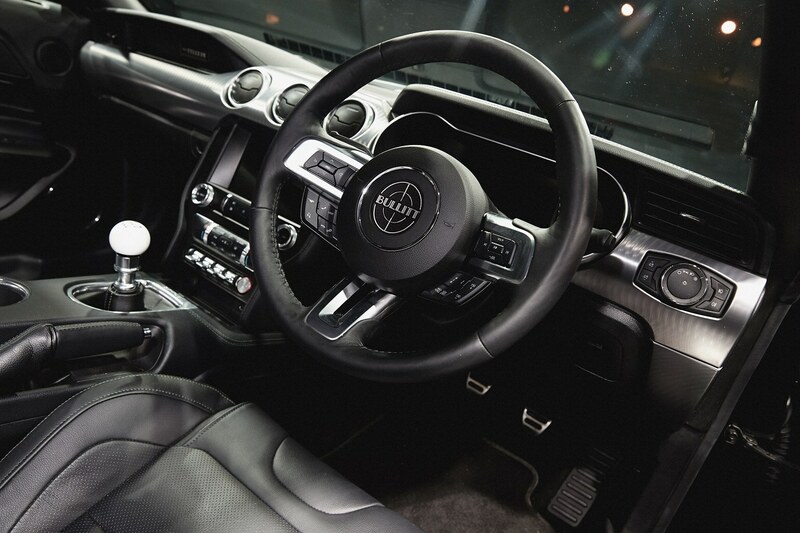 The interior delivers Ford’s 12-inch all-digital LCD instrument cluster and offers Recaro sports seats. Interior seat-, centre console- and instrument panel-stitching reflects the exterior colour choice, and each Mustang Bullitt features an individually numbered plaque in place of the traditional Mustang emblem on the passenger-side dashboard. A nice touch that salutes a silver screen legend! 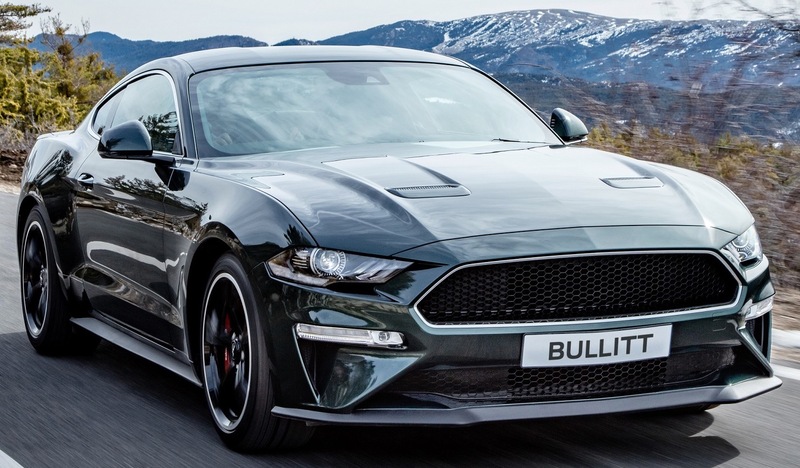 The new Ford Mustang Bullitt also features as standard Ford’s new rev-matching technology and premium B&O Sound System that delivers 1000 watts through 12 high-performance speakers. Beneath the skin, the Mustang Bullitt has a powerful V8 engine. It delivers 12.4 l/100 km fuel efficiency – is enhanced with an open air induction system, and uprated intake manifold, 87 mm throttle bodies and unique Bullitt powertrain control module calibration. The aforementioned rev-matching technology for the six-speed manual transmission uses the engine’s electronic control system to briefly increase engine rpm as the driver downshifts. This matches the engine rotation speed to that of the gear that is being selected for smooth, seamless gear-changes accompanied by a “blip” of the throttle. The standard B&O Sound System delivers a rich audio experience for occupants whichever seat they occupy. The system features a dual-voice coil subwoofer for deep, crisp bass and high-performance three-way front door speakers for even sound distribution throughout the cabin. Unique to the Bullitt, the welcome screen starts in green with an image of the car rather than the pony, and as a cool nod to the original car’s interior, the gear shifter features a white cue ball gearshift knob. And in addition to the standard seats that feature green stitching and a driver’s seat memory function, optional Recaro seats are trimmed in black leather. Other features that pay tribute to the car McQueen drove are subtle chrome accents around the grille and front windows, and a unique black front grille. Inside and out, the vehicle uses minimal badging; only the circular faux fuel-filler cap Bullitt logo on the rear centre is visible on the exterior. A sophisticated ‘MagneRide’ adjustable suspension system is also offered and uses an electronically stimulated fluid inside the damper to respond in real time to changing road conditions, optimising handling without sacrificing ride comfort. An active valve performance exhaust system is standard, enhancing the V8 engine’s signature burble. Last year at the Goodwood Festival of Speed, near the south-coast of England, Ford delivered the first appearance outside of the U.S. of the iconic 1968 Ford Mustang GT driven by Steve McQueen in Warner Bros. Pictures’ classic film “Bullitt”. Two identical 1968 Mustang GT fastbacks were used in the filming of the movie that debuted in theatres on Oct. 17, 1968. After filming, the cars went their separate ways: the hero vehicle driven by McQueen in the movie was sold by Warner Bros. to a private buyer, and the other – used in many of the jumps during the famous chase scene – was sent to a salvage yard. That jumper vehicle resurfaced in Baja, California, in early 2017, but the other was lost to history… until earlier this year. Sean Kiernan, owner of the hero vehicle, inherited the car in 2014 from his late father, Robert, who had purchased the vehicle in 1974. To fulfil his family’s lifelong dream, Sean contacted Ford and the two parties worked together to reveal his movie star car firstly at the 2018 North American International Auto Show in Detroit, and later at the Goodwood Festival of Speed, alongside the new Ford Mustang Bullitt.